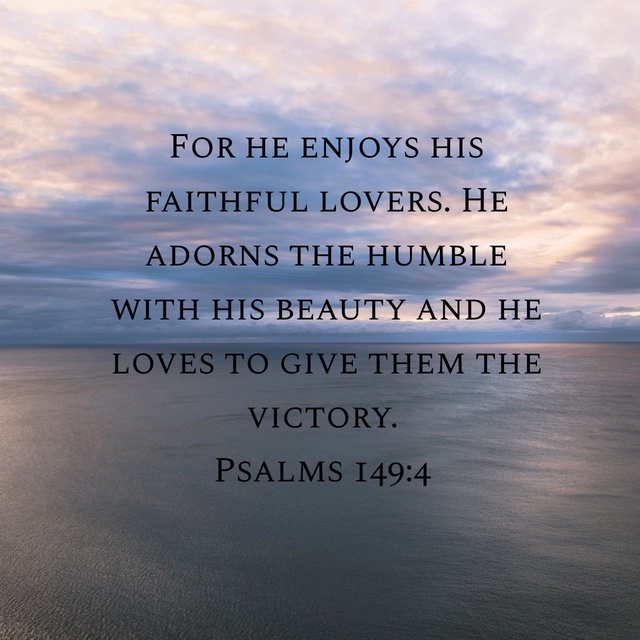 Faithful Lovers – God is Amazing! There is this Psalm, it’s always inspired sense of awe as well as convicted me. This Psalm is 149:4. The first feeling I get, awe, is because the God of the whole wide world, the whole milky way, and the entire galaxy, the God that rules everything, that is above all, have powers beyond our imagination takes pleasure in his people. His church. His beloved children. That is so amazing. It’s a blessing beyond anything we ever could ask for and I feel like sometimes we can forget that. The second thing is conviction, he adorns the humble. Well am I humble? It’s not like I’m a bragger or anything most of the time, but when I come before God, is my heart always where it needs to be? Do I come before him with the respect he deserves.Do I come before him always ready to admit where I did wrong? When I say thank you God for the sacrifice that Jesus made is it out of actual gratefulness, or is it obligation, or habit? Is my heart humble before the King of Kings and LORD of Lords? Who am I that you have blessed me with life? Thank You God, for what Jesus did. The sacrifice He made. Thank You for this life. For this world. For the wonder of Creation. Thank You for everything God. You are so good. I love you. *These are some other verses that are either related to or reference the above scripture.